South Fork State Recreation Area is comprised of the 1,650-acre South Fork Reservoir and the surrounding 2,200 acres of rolling hills and meadowlands. This is a popular area for camping, boating, picnicking, hunting, wildlife viewing, and winter sports. The reservoir is justly famous for its trophy Rainbow and Brown trout and bass fishing (and special fishing regulations are in effect). Archery and shotgun hunting are allowed in season (carry proper licensing in your pocket) but steer at least 1/4 mile clear of all developed campsites and boat ramps. South Fork State Recreation Area allows picnicking almost everywhere but there are no developed day-use facilities. There is a 25-site campground near the north park access road. The campground is open from early May to November 15 and offers campsite tables, fire grills and a flush-restroom with showers. Open camping is also allowed along the western shores of the reservoir. Near the north park entrance road is an RV dump station that is open year-round. Most of this area is Pack it in, Pack it out. 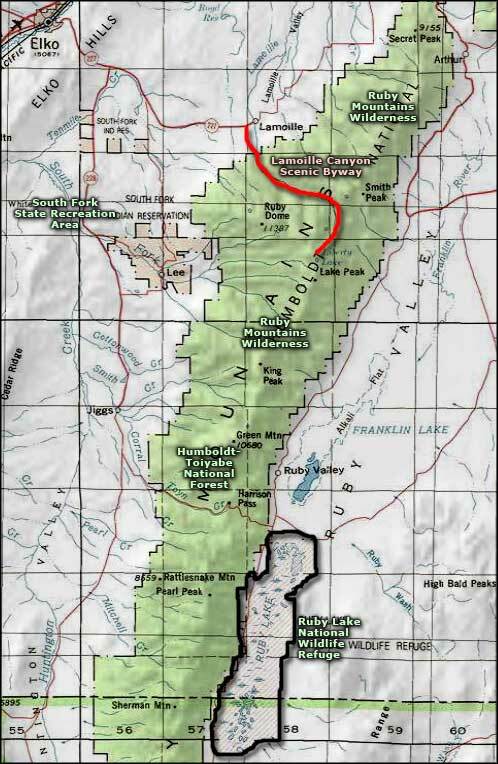 South Fork State Recreation Area is open year-round and is located on State Route 228, 16 miles south of Elko, near the western foothills of the Ruby Mountains (the Ruby's are actually 10-15 miles to the east and rise to 11,387' at Ruby Dome). Entry fees: $7 per vehicle per day for non-Nevada residents, $5 per vehicle per day for Nevada residents. Camping fees: $14 per site per night for non-Nevada residents, $12 per site per night for Nevada residents. Boat launch: $10 per boat for non-Nevada residents, $8 per boat for Nevada residents. Boat/Camp Combo: $17 per day/night combo for non-Nevada residents, $15 per day/night combo for Nevada residents. Group Campsite: $20 + normal campsite fees.